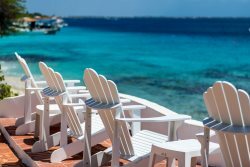 The spacious six-bedroom Oceanfront Hamlet Villa 10 provides guests with exceptional lodging in Bonaire with each bedroom offering air conditioning, a private bath, and a flat screen cable TV. With the ocean right outside the front door, this is an ideal unit for divers as it also has an outside shower and gear locker. Make use of the private beach access for snorkeling or diving or visit the Hamlet Oasis Complex’s pool with friends and family. The vacation rental is fully-furnished with a complete kitchen, spacious air conditioned living area, and large outside porch. You’ll love the beautiful ocean views from the terrace as well as the unit’s proximity to the dive shop next door. Book online today! This is a self-catering accommodation. Maid service is not typically included, but is available upon request and at additional costs. The information presented here is deemed reliable, though not guaranteed. Please verify all information for accuracy before you make any rental decision.